As one of the most commonly used means of storage in virtually every industry in every part of the world, today's pallet racking systems offer a variety of components and accessories. Combining these components and accessories correctly helps provide a customer with the best storage system for their particular requirement. The Surplus Warehouse carries common and hard-to-find pallet rack systems including teardrop and keystone styles that are available in different load ranges, depths, heights, etc. Each of our featured brands of pallet racks has specific advantages and comes equipped with a wide range of accessories. But what distinguishes one pallet rack brand or style from another? The type of metal used to make the rack, and the type of connector for the beam and upright typically constitute a brand or style. Your operation's requirements may mandate the use of a particular style, type, or combination. To find the right match for your need, call a consultant at The Surplus Warehouse now. What type of items are you planning to store? What size are your pallets (dimensions and height)? How much does each pallet weigh? What type of lift equipment are you using? Do you require wire deck or pallet supports? The answers to these questions will enable us to find the right storage system to match your requirements. 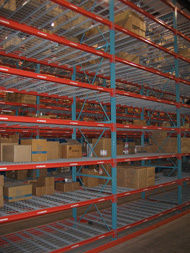 Once you chose the correct style of pallet racking system for your warehouse operation, you can create a unique storage system tailored to meet your every need with accessories like row spacers, column protectors, wire deck, pallet supports, and anchors. Philadelphia's leading pallet racking supplier and used and new material handling dealer, The Surplus Warehouse, carries several styles of pallet racks as well as types of storage rack. By offering so many styles, The Surplus Warehouse is sure to have the one that will interchange with your existing rack system. Or if you do not have a pallet rack system currently in place, our sales representatives can help you chose the style and layout that works best for your application. Contact us now at sales@surplusrack.com or (215) 755-7000 to discuss your needs. for diagrams of each style. The Surplus Warehouse can turn an organizing ordeal into a warehouse wonderland. From planning to installation, the experts at The Surplus Warehouse will be with you each step of the way, providing your company with the most ideal industrial shelving system money can buy. Plus, if you need to replace an existing industrial storage system, The Surplus Warehouse will travel from their facility in Philadelphia to your location in Pennsylvania (PA), New Jersey (NJ), Delaware (DE) or Maryland (MD), to buy, dismantle and remove your used storage shelving. 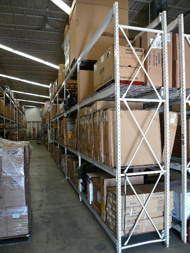 No one makes it easier or more cost-effective to handle warehouse shelving needs than The Surplus Warehouse.